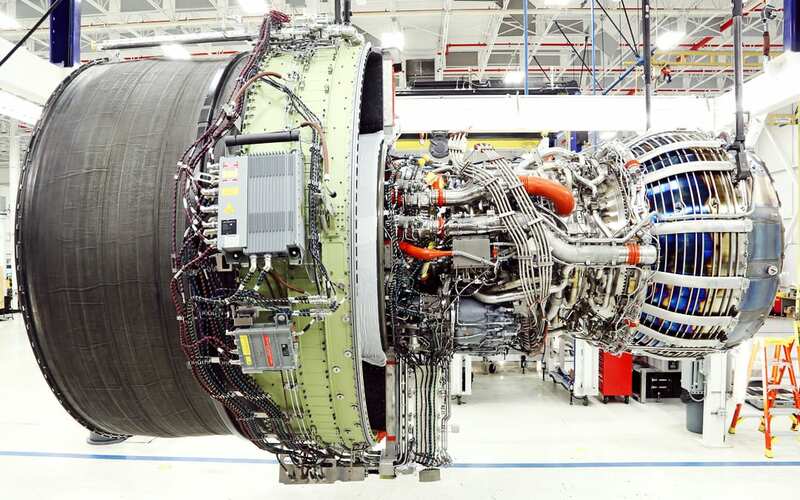 A recently developed data analytic, examining fan vibration, is enabling GE Aviation to predict CF34-8 engine fan vibration exceedances up to 10 days before they normally would be detected, significantly reducing operational disruption. The Fan Maintenance Indicator (FMI) is powered by a sophisticated algorithm that combines fan vibration data with a historical volatility factor, increasing the confidence factor and reducing false positives. Since introduction of FMI, fan-related disruptions have been reduced by more than 60 percent. As lubrication in the fan pin joint wears out, the average vibration levels go up and the scatter (range) of the vibration goes up. Since the FMI increases with average vibration level and scatter, the FMI (depicted in green) increases and provides insight into the deterioration of the lubrication. When an FMI plot looks like this, the root cause of the high vibration level is typically lubricant deterioration, and a pins swap and relube is the recommended corrective action. Different root causes reveal themselves as different data plots. For instance, an increase in the raw data plot of vibration, coupled with greater data scatter and a climbing FMI plot is an indication that lubrication in the fan pin joint is wearing out. Other combinations of factors produce unique data signatures that call for specific maintenance procedures. GE Aviation’s Fleet Support organization uses the FMI to monitor the CF34-8 fleet, issuing fan vibration alerts when the FMI climbs above a specific threshold. Operators receive a notice along with the data plot and have access to GE’s team of Field Service Engineers for help in determining the correct maintenance action. Using analytics to improve customer outcomes is at the heart of GE’s vision of becoming a “Digital Industrial” as the company exits its financial businesses and focuses around its core industrial businesses, including aircraft engines. For more information on FMI, please contact your GE Aviation representative or GE Aviation Fleet Support. Toll-free in U.S.: 877-432-3272, International: +1-513-552-3272, email: [email protected]. PreviousThe Smithsonian goes to school!